One sale now, but do you want it? When Motorola announced the Moto X was finally coming to the UK we were given a release date of February 1, but it turns out it's already here. High street retailer Phones 4U is already peddling the Motorola Moto X with contract, PAYG and SIM-free options available. 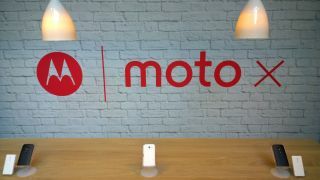 The Moto X arrives with black and white colour options (Phones 4U has exclusive access to the latter) though at £389.95 it doesn't exactly offer the best value for money. Your £400 will get you a 4.7-inch HD display, 1.7GHz dual-core processor, 2GB of RAM, 10MP camera and Google's latest operating system - Android 4.4 KitKat. Now that doesn't sound too shabby, but you can pick up the more powerful Nexus 5 (with a bigger, higher resolution display too) for £299, while the HTC One Mini and Galaxy S4 Mini are also fighting for attention in the Moto X's price bracket.